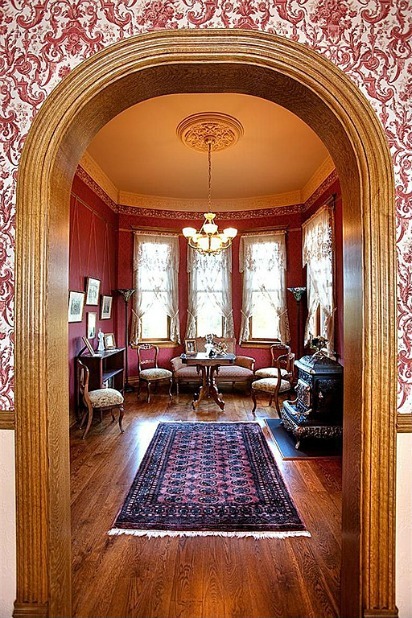 The house cost $7,500 to build in the 1800s and boasted central heating in addition to fireplaces. 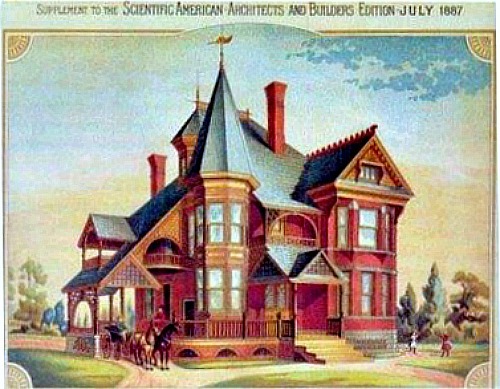 The house is discussed in the book American Architecture by Leland M. Roth as a classic example of the Queen Anne style. Wow. Their version cost a lot more than $7,500 to build in 2002, as you can imagine. They list all the construction costs in detail on their website. Dreams like this don’t come cheap! The original Victorian, which is listed on Kansas City’s Historical Registry, had 5 bedrooms and 1 bath, with about 3,000 square feet. 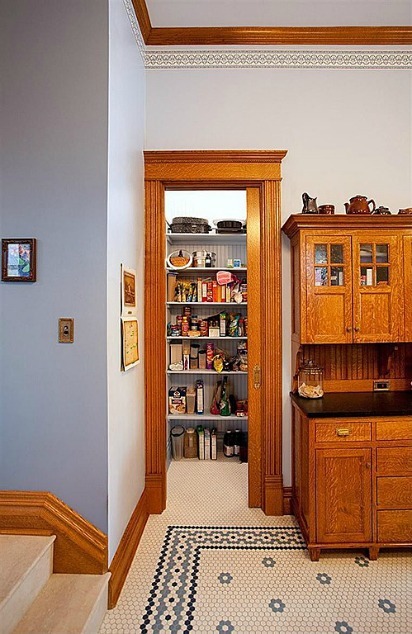 This one also has 3,000 square feet, but with 4 bedrooms and 2.5 baths. 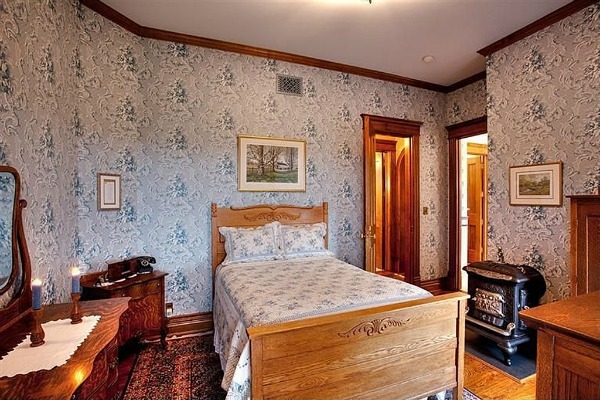 They were able to source some authentic Victorian-era wallpaper patterns for the house. “For years, we have enjoyed touring authentic museum houses, studying the interior and exterior details,” the owners say on their website. 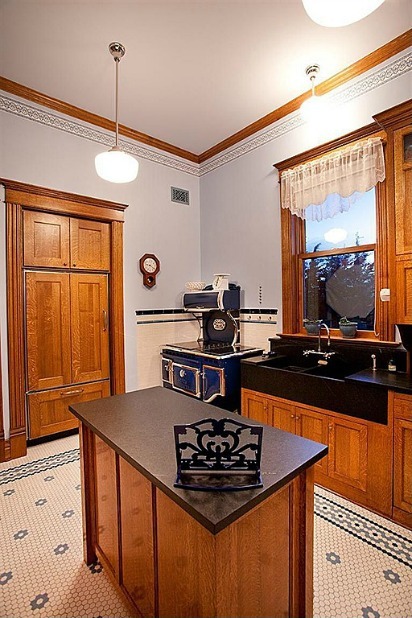 Now they’re selling their new-old Victorian, and it’s on the market for $695,000. 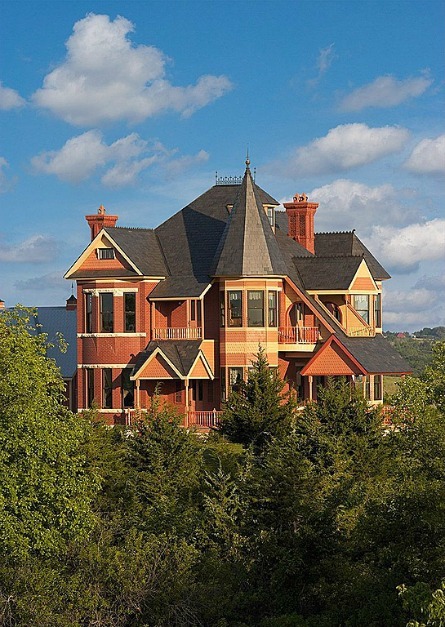 Visit the Castle Victorian website and the listing by David Kaseman at RE/MAX for more info and photos (taken by Don Farrall of Light-Works Studio). 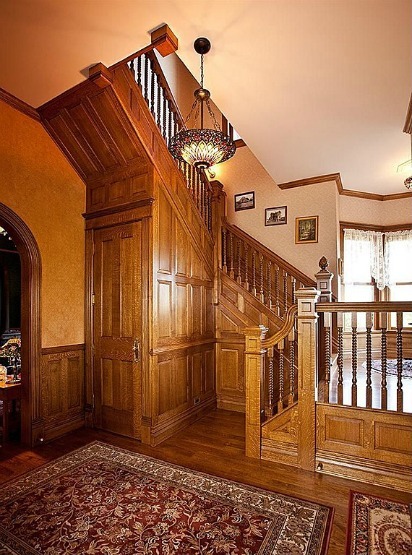 The woodwork is really beautiful. 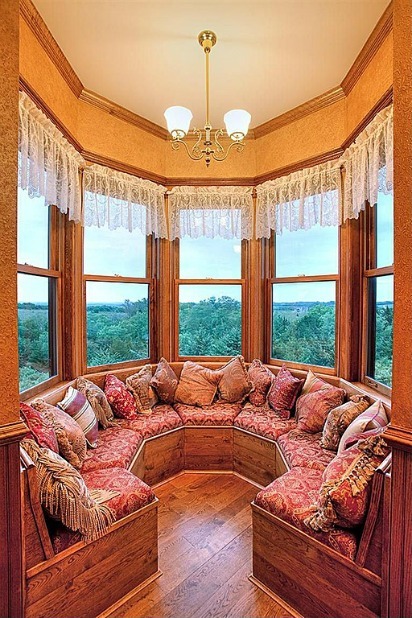 And that built-in turret seating… a reader’s paradise. It really is. Love that turret windowseat! This is my definition of a magnificent house! What a great home. Makes me imagine going back in time and seeing the original home as the original Victorian owners saw their home — where everything was brand new to them. Very neat. I know they tried to sell a few years back, hopefully they find the right buyer this time. Add a master suite coming off the dining room (made to look like a later addition, of course 😉 and it would be perfect for today. 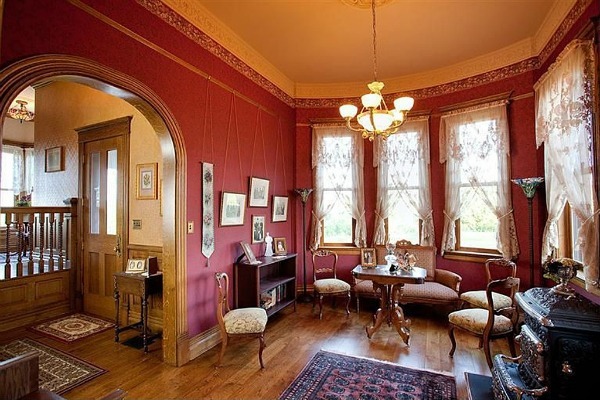 I’d go period with much, but maybe not as authentic as with this Victorian. I really wish some company would bring these homes into today, reproducing and updating them. So many adorable plans! That’s a good one, Brandy. 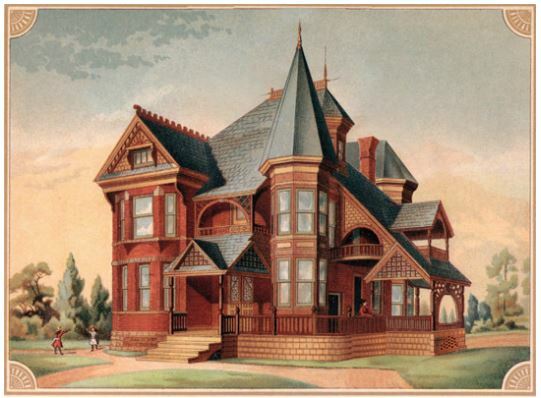 I wish we could still buy houses like that through catalogs! was to buy from catalog and self build. What a great idea, to build a new house from an old plan. I am especially impressed with the woodwork. 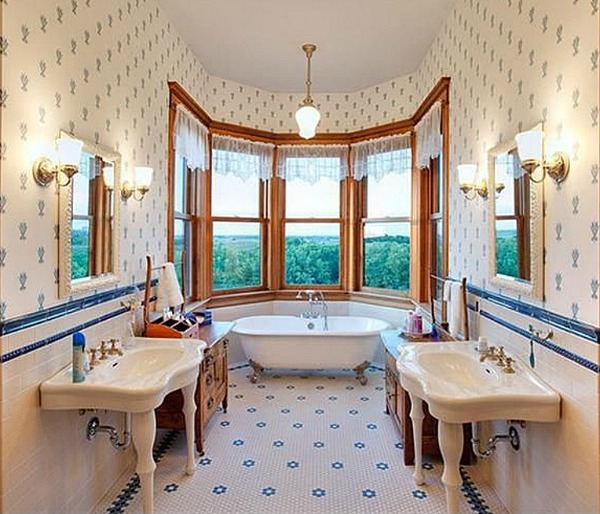 And I love the bathroom floor, and the tub in the bay window. I can’t believe that is selling for only $695,000! I love the tile floor in the kitchen. In fact, I love all of the details on the interior. I wonder how it would look furnished with more contemporary furniture? While I love Victorian architecture, I’m not a huge fan of Victorian furniture. I think the exterior looks a little too McMansiony. It may be the use of bricks that gives me that impression. Well said! There really is something special about an old house. Good point, Julia. 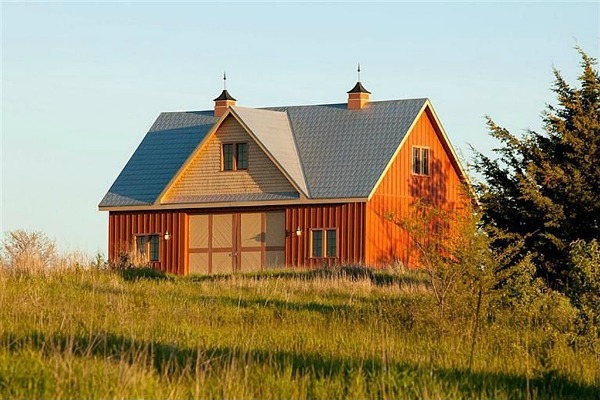 The homes we love are not always perfectly located to suit our needs. Google street view cam went by in 2011 and it looks like the new owners were starting work ! Good sleuth work, Jen! Thanks!! Beautiful. And I think this all helps bring attention to the degree of the quality construction and materials that were used in the originals, which duplicating now is incredibly pricey. That should help spotlight the value of historic old buildings. I like the exterior but they left behind some of the rounded arching for more squared off openings (like over front porch and to the left side of house) and I think that diminishes the appearance a bit. I also don’t like the kitchen at all. 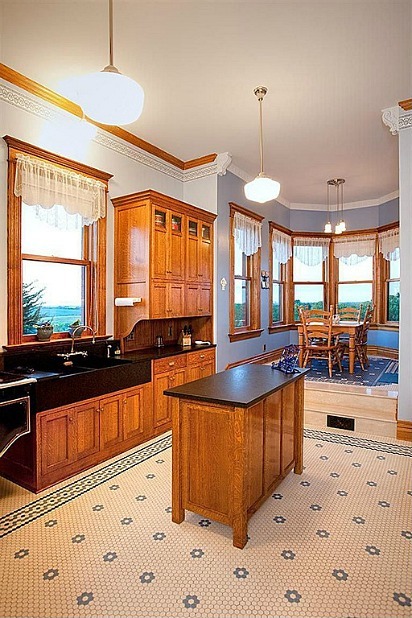 Do they cook on that little stove in the corner and the island seems so undersized for the floor space. And I don’t like the two steps up into the eating area — I could totally see myself tripping all the time and sending food flying all over my family 🙂 Much of the house is impressive though and loved the reading area in that one tower. We built our home from “adapted blueprints” out of a book of catalog cottages and love it. 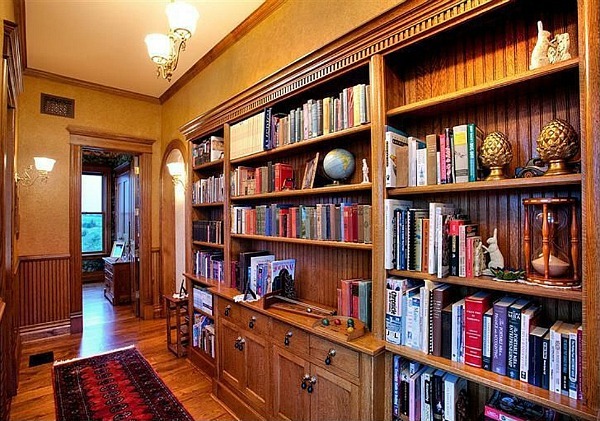 I wonder why they did not put in more bathrooms for such a large house, but I do love the window seat and library area. Hope they get what they are asking for their labor of love home. This is just beautiful! I love the idea of “new old” houses- I have been designing them in my head my whole life… 🙂 My “new old house dream” is Gull Cottage from the Rex Harrison version of “The Ghost and Mrs. Muir”. It’s sad that now you can’t find hardly any information about that lovely cottage (now torn down), but I create and recreate it whenever I watch the movie (you should see my “new old” house design binder!). 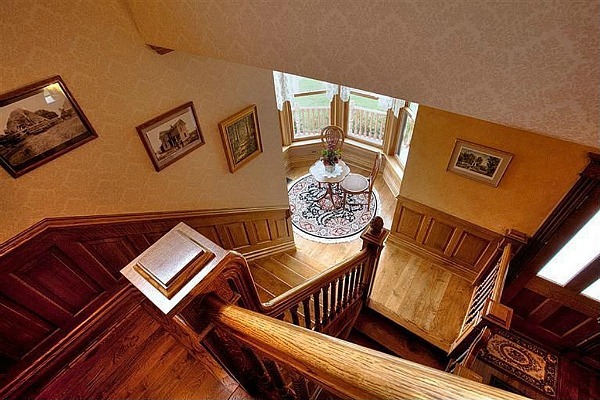 That staircase! That balcony! Thanks for sharing this wonderful “new Victorian”! Definitely saving this one to the “totally buying this one in my imagination” file! Ooh, that’s a good one, Cheyenne! I loved your post. I show dogs and travel the country a bit. In Dubuque, IA there is this lovely spot that was so reminiscent to me of the photo you posted here. I LOVE this so much. I want it. I cannot imagine anything that would induce me to sell it if it were mine. Hi Julia the sun is out and the lawn mower brigade are in full swing. Looking at this beautiful home has taken my breath away (hyperventilation) by the style but most of all by the amazing use of timber I’m not a big fan but this has converted me. Thank you for sharing beauty. Till next time Regards Esther from Sydney. PS I envy you the cold you get to drink hot chocolate (with marshmallows I’m thinking) after all this I’m having another coffee. 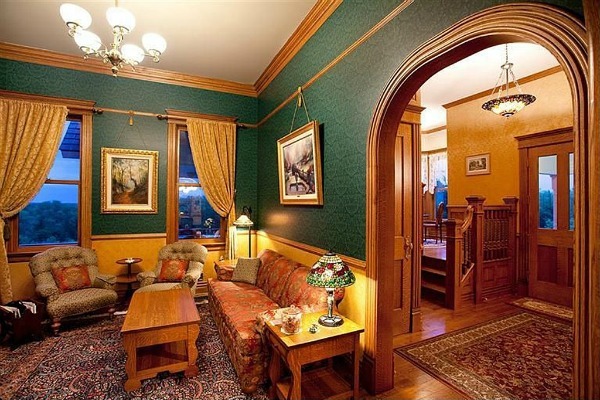 I love the new-old Victorian. The details are spectacular and it looks like it has been there since the early 1900s. I just have to say, that I love that turret window seat. I want one in my dream home. It’s a lovely reproduction and a labor of love. It sad they are taking such a bath on the list price, as their construction costs are claimed to be over a $1M (not including land). Thanks so much for mentioning our house again!! We will miss it, but the pull of our grandson in Lincoln is too much for us. He will be 2 in January, and we love him to death; so we hope to move back into Lincoln to be just a little closer, though we are not far now. 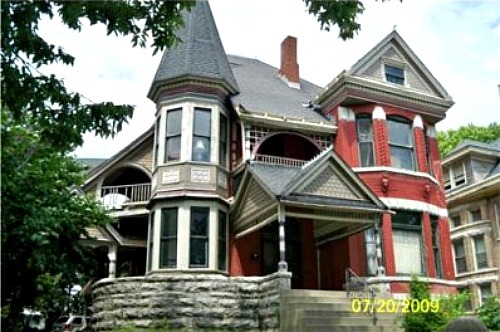 The Kansas City victorian was purchased (the list price before it sold was around $75,000). I do not know the current owners, but the neighborhood has a Facebook page so I sent them an email with your story on both of the houses. It truly is a great neighborhood AND it was just named This Old House’s best midwest neighborhood for old homes! This is great — thanks, Derek! This house is next door to me in KC. It is even more amazing in person. It is currently being restored and will be the crown jewel of our neighborhood. Ps. 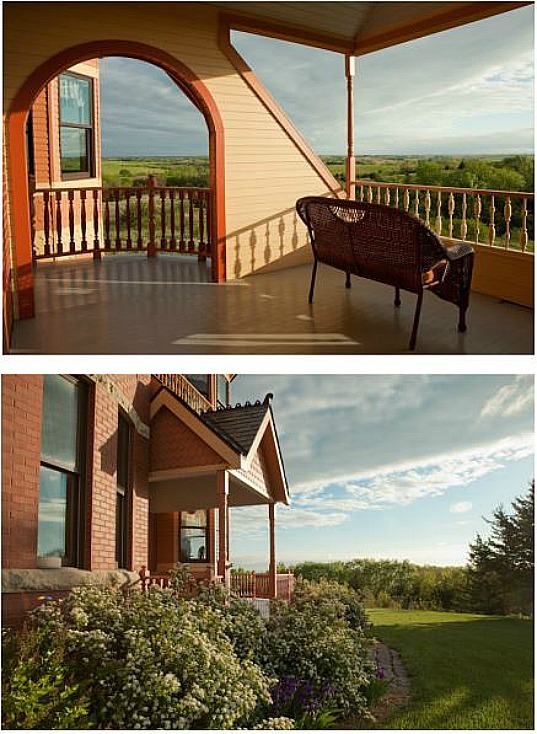 My house (which is seen in some shots) is currently for sale! 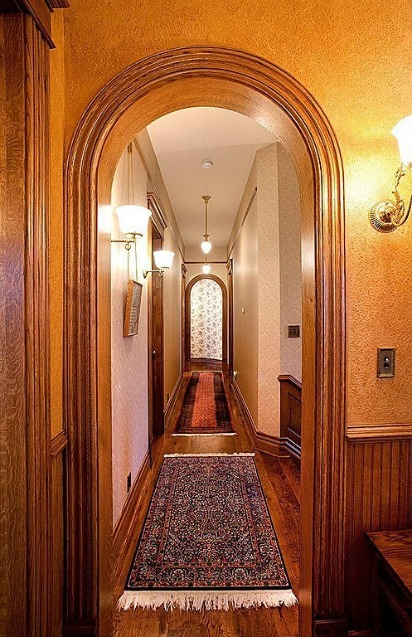 You could own a piece of history right next door to this Victorian beauty! I’m so glad to hear that it’s being restored! Feel free to post the link to your listing here, too. I’m sure everyone would love to see it. Best of luck with it! We live across the street from the Bryan house. A huge job to restore it; fortunately the owner is young and she has a tremendous amount of enthusiasm for the project. Almost all of the “Gold Coast” mansions along Independence Ave in Historic North East Kansas City are gone, but many of the smaller (ours in only 3700sqft!) homes that were built on the streets going north from the Ave are being restored. Some as faithful to the original as possible, others, like ours, are maintaining the exterior look of the house, but from necessity are more modern inside. Many of the houses in these neighborhoods became rentals or were made into apartments in the 30’s and 40’s. Often the nicer features of the houses were removed to be sold. 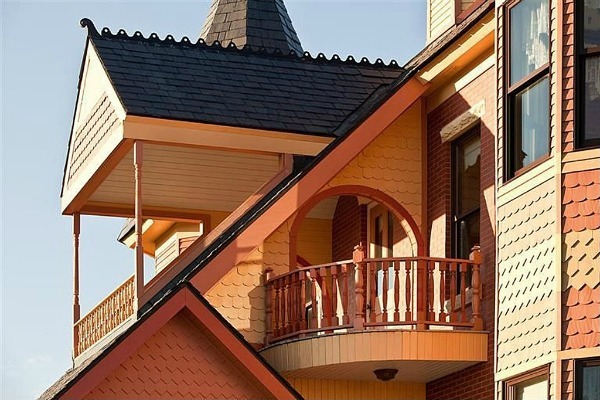 Our 1900 built brick American Four Square retains its look outside, with the exception of the original red slate roof. On the inside the main stairway, coal fireplace w/mantel (chimney long gone) and one stained glass window in the dining room are the main features remaining on the first floor. 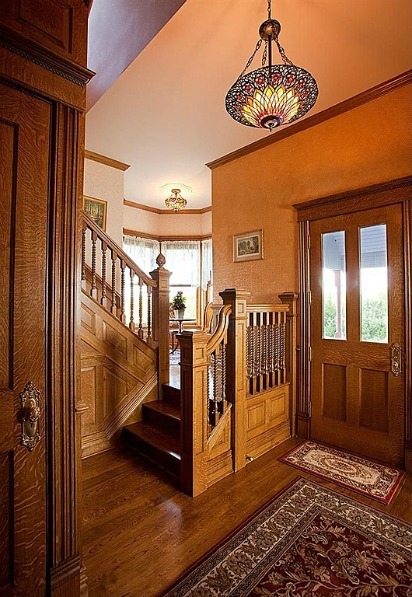 Some exquisite, but badly in need of repair, beveled leaded glass double hung windows on the stairway landing and in the master bedroom suite round out all that remains of the original fixtures. BTW, today when I went to look at the listing of the Garland NE re-creation the listing had been removed. Here is a photo from the Kansas City Library showing in the left foreground one of the Independence Avenue mansions. In the center background are some houses on the west side of Garfield Avenue, including the Bryan house, unfortunately obscured by the houses south of it. Another interesting note. Using an inflation calculator, $7,500 in 1885 is equal to $188,725 in 2012. Or, reverse, $7,500 today would be worth $304 in 1885. That gives it some perspective — thanks! Oh, wow, that must have been an amazing place. I love tree houses. Thanks for the link, Shelley!